AKIPRESS.COM - Kazakhstan’s economic growth is forecast to slowdown in 2019 and 2020, reflecting lower oil prices and reduced growth in China and Russia. Aside from oil revenues, public investment is expected to become a key source of economic growth in the coming years, says a new Asian Development Bank (ADB) report released today. 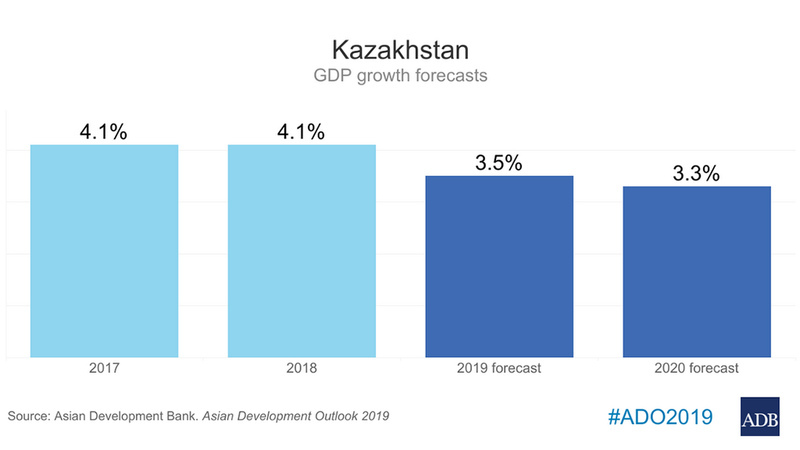 The Asian Development Outlook (ADO) 2019, ADB’s flagship economic publication, projects the growth of Kazakhstan’s gross domestic product to moderate to 3.5% in 2019 and 3.3% in 2020 from the 4.1% achieved in 2018. Average inflation is estimated to remain at 6.0%, at the upper end of the central bank’s target range for the year, and expected to moderate to 5.5% in 2020, as authorities maintain measures to absorb excess liquidity, countering inflationary pressures imposed by higher import prices as the tenge depreciates. Food price inflation is projected to slow down to 5.2% in 2019 and 5.0% in 2020 due to incentives provided for domestic food production, the institutionalization of stabilization funds for critical food items, and the imposition of selective price controls. Industry will expand by 4.3% in 2019 and 4.4% in 2020, according to ADO, as state led-investment in the manufacturing and utilities’ sectors will partly counterbalance the limited gains in oil production, which are expected to decline in the first half of 2019 as Kazakhstan needs to meet its commitments with the Organization of the Petroleum Exporting Countries (OPEC) and the three major oilfields (Tengiz, Karachaganak, and Kashagan) undergo planned maintenance. Agriculture is forecast to grow by 3.0% in 2019 and 2.5% in 2020 as a result of the updated state support program—although more could be done through focused intervention, Mr. Capannelli said.